When Red Dawn was released in the U.S. on August 10, 1984, the Cold War had been simmering for more than 35 years, and a fear of nuclear war between the US and the USSR seemed to permeate the culture. WarGames, a dramatic thriller about averting nuclear war, had been one of the highest-grossing films of 1983, and the November 1983 TV movie The Day After was watched by 100 million shocked viewers. Rather than Soviet nuclear strikes devastating America’s heartland, however, Red Dawn, portrays more conventional elements of an invasion by the Russians and their allies. As the Soviet troops begin their assault in Colorado, several small-town teenagers head to the mountains to escape the invasion, but soon they find the courage to wage guerilla warfare against the occupying enemy. © 1984 Metro-Goldwyn-Mayer Studios, Inc. Although Red Dawn was set in a town called Calumet, Colorado, the movie was primarily filmed in and around Las Vegas, New Mexico. SPOILER ALERT: The descriptions below include plot points of the film. If you haven't seen the movie, or need to watch it again, I recommend Shout! Factory's Red Dawn [Collector's Edition] Blu-ray. The collector’s edition Blu-ray contains the bonus feature “WWIII Comes to Town,” carried over from the 2007 DVD release, which features a local gentleman named Mykle Williams touring the site of several of the locations. The documentary was instrumental in locating the filming sites from the movie. 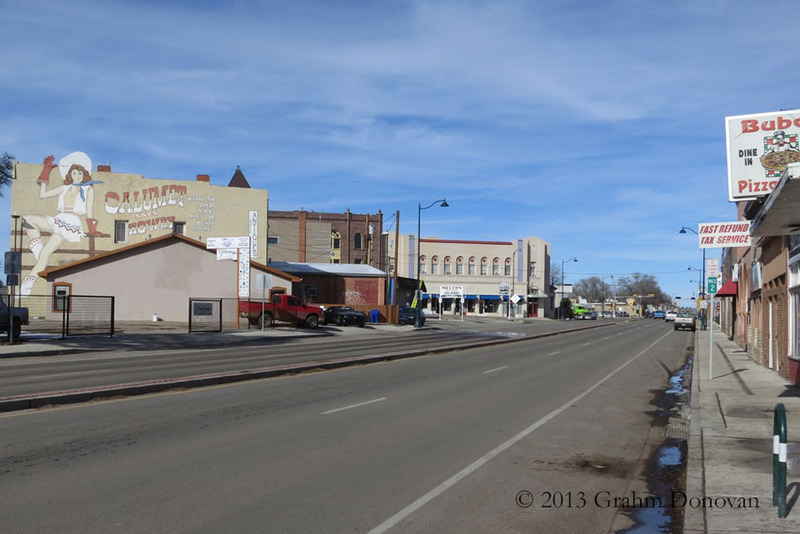 The Silver Screen Sites page always does a terrific job of matching the on-screen images with the real-world locations, and their photo album "'Red Dawn' Location Photos (ORIGINAL FILM)" was also a tremendous help with finding the sites when I visited Las Vegas, NM in November 2013. The film opens with tranquil scenes of nature and views of quiet, small-town Colorado. Briefly, the view pans across an intersection with a bar on one corner and a building across the street featuring a mural of a cowgirl proclaiming “Calumet Says Howdy." The intersection is the site of several later scenes. This scene was filmed at the intersection of Grand Avenue at Lincoln Street, Las Vegas, NM 87701, with the “Calumet Says Howdy” mural located on a building at 518 6th St, Las Vegas, NM 87701. A brief shot shows small children at a crosswalk in the morning, presumably on their way to an elementary school. The elementary school with a crosswalk is actually the town's Carnegie Library, 500 National Ave, Las Vegas, NM 87701, one of the thousands of libraries build with funds from philanthropist Andrew Carnegie. Reference: I was able to locate this site thanks to the Silver Screen Sites photo album "'Red Dawn' Location Photos (ORIGINAL FILM)". The school is actually the Memorial Middle School, 947 Old National Road, Las Vegas, NM 87701. Jed drives several teens to the Morris’ Market, where Robert (C. Thomas Howell) tells his father, Mr. Morris (Roy Jenson), about the attacks. After explosions blast from a nearby ridge, the boys fill Jed’s truck with survival gear, and the crew heads down a gravel road leading toward the mountains. The gas station was a set built for the movie at the intersection of NM 518 at Co Rd A3, Las Vegas, NM 87701. As the boys speed away from Morris Market, Jed spots a Russian roadblock on the escape route, so he swerves his truck off of the road and into the fields. The roadblock is approximately a mile-and-a-half from the gas station, on Co Rd A3, Las Vegas, NM 87701. Reference: This site is featured in the Blu-ray special feature documentary “WWIII Comes to Town.” The Silver Screen Sites photo album "'Red Dawn' Location Photos (ORIGINAL FILM)" also served as a reference and has several then-and-now photos of the location. On a reconnaissance trip along the town’s main street, Jed, Matt and Robert are shocked by the drastic changes wrought by the communist takeover. Soviet signs and military equipment are all around as the boys walk past a theater and bank before they seek out information in the Murphey's Drugs shop. The tense stroll is seen beginning at Douglas Ave at 7th Street, Las Vegas, NM 87701 and continues down the 600-block towards 8th Street. The boys learn that the communists are holding dissidents in a "reeducation camp" set up at the local drive-in theater. Jed and Matt find their father, Mr. Eckert (Harry Dean Stanton), who delivers harsh truths and implores of his sons, "Avenge me!" This was the actual location of the Fort Union Drive In Movie Theatre, 3300 7th Street, Las Vegas, NM 87701, which continues to operate as a drive-in. 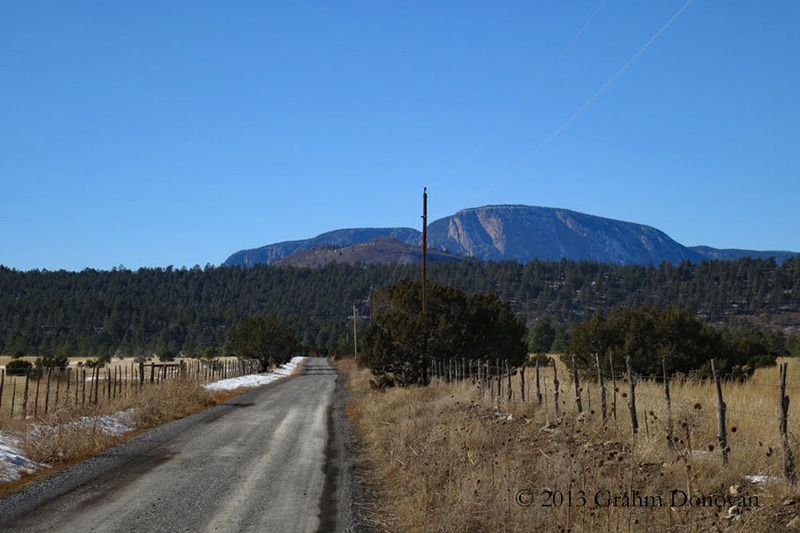 This site is located approximately 25 miles from town on New Mexico 104, Las Vegas, NM 87701. Reference: I was ecstatic when I discovered the site by accident while researching another movie that was filmed in the area. When I visited in 2013, I couldn’t find anything online about the location. The teens continue developing their guerrilla tactics with an ambush against a stopped enemy convoy holding American prisoners. After the battle Aardvark raises his rifle and boldly yells "WOLVERINES!!!" This site where this memorable scene was filmed is also on New Mexico 104, Las Vegas, NM 87701, approximately five miles east of the gas station. Reference: I located this site based on the “WWIII Comes to Town” documentary, which mentions the route number. When I visited in 2013, I couldn’t find anything online about the location. The communists, including Cuban Colonel Bella (Ron O'Neal), Soviet Colonel Strelnikov (William Smith) and the Nicaraguan Captain (Judd Omen) have their headquarters in a building by a rail yard. 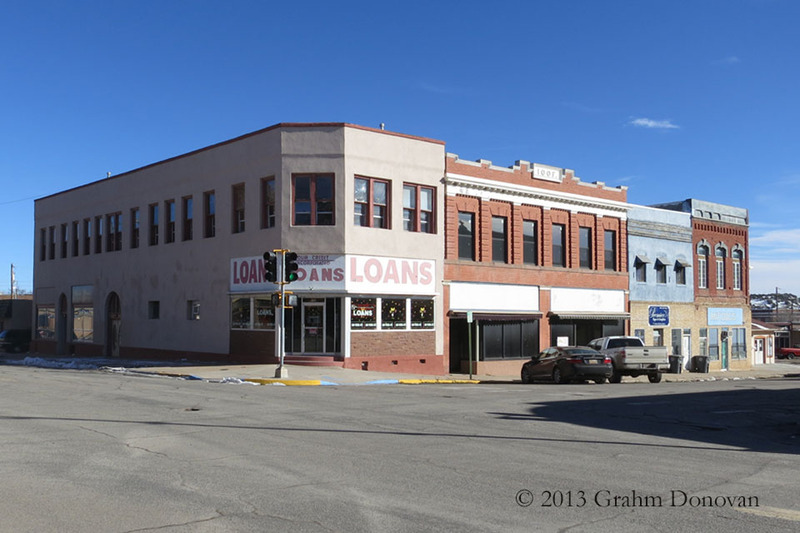 The building is the former Hotel Castaneda, 524 Railroad Avenue, Las Vegas, NM 87701, which had been closed for decades by the time of filming. The building appeared abandoned when I visited in 2013, however, the building is now in the hands of new owners with plans to restore the hotel to its former grandeur. Reference: This relatively well-known location is listed on the Fast-Rewind.com site. After fierce fighting, Jed and Matt find peace in the frozen night at a nearby park. The park is the town's Lincoln Park, Lincoln St at 7th St, Las Vegas, NM 87701, which is about a block from the "Calumet Says Howdy" intersection. Red Dawn was the first movie released with the Motion Picture Association of America (MPAA) rating of PG-13. A now-defunct group called the National Coalition on Television Violence decried the movie for having an average of “134 acts of violence an hour,” and critics have long called the movie as “jingoistic.” However, Red Dawn did well at the box office, and is said to be the 20th highest grossing film released in 1984. The young cast was then relatively unknown, but several went on to successful careers, including Patrick Swayze; C. Thomas Howell; Lea Thompson; Charlie Sheen and Jennifer Grey. Like the cast, Red Dawn has had a long shelf-life in popular culture, even inspiring a (poorly received) 2012 remake. People still talk and write about the film, and fans still visit Las Vegas, New Mexico to see where it was filmed.